When many people think of the most devastating conflicts currently playing themselves out around the globe, they often jump to the war in Syria, Afghanistan or Yemen. Although Syria’s civil war did result in the most fatalities in 2016 (an estimated 50,000 people), the second-deadliest conflict occurred much closer to home and was accompanied by a shockingly low amount of reporting – Mexico’s drug war. An article from the Huffington Post reported that Mexico’s ongoing drug war was the cause of 23,000 deaths last year, which is equal to the combined casualties from Afghanistan and Yemen (Cook 2017). 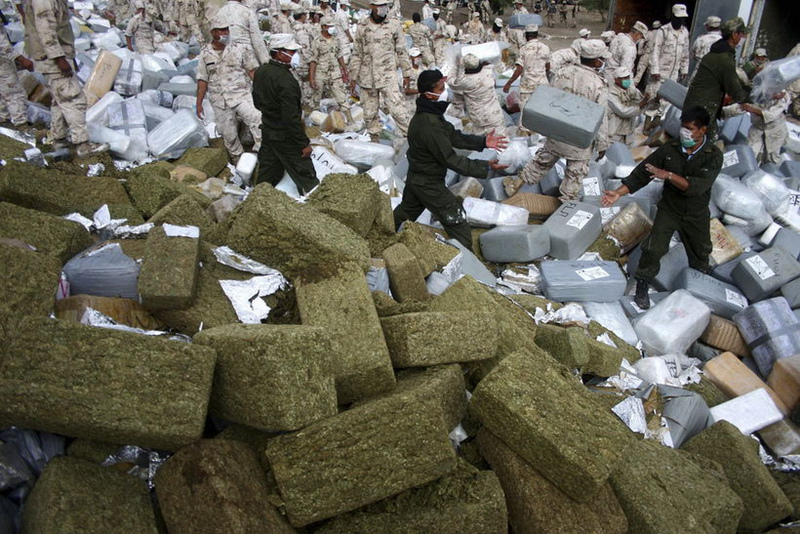 The Mexican war on drugs was initiated over a decade ago on December 10th, 2006 in the state of Michoacán. Felipe Calderón had been inaugurated only eight days before, and many saw his decision to send 6,500 troops into the cartel ridden area an attempt to legitimize his less than favored election. A total of 20,000 troops were soon engaged in countrywide operations, and for citizens suffering from the constant murders and corruption which past president Vicente Fox had been unable to control, Calderón’s actions were initially celebrated (Lakhani & Tirado 2016). Hindsight has provided the realization, though, that this move potentially provoked the conflict into its even more dangerous actuality. In 2007, the first full year of the drug war, 2,837 people were killed according to a report made by the Mexican government. By 2011, the government reported that within the first four years of the conflict a staggering 34,612 citizens had been killed (CNN Library 2017). Currently, the total death toll is estimated at over 200,000 people, with an additional 28,000 desaparecidos, or missing (Lakhani & Tirado 2016). The original plan – to eliminate the existing drug cartels, especially through targeting their high-profile leaders – quickly backfired as groups fluidly combined forces, created new gangs, or splintered off from pre-existing cartels. In effect, what began as a war against a few larger cartels has become a battle against a limitless number of subgroups that are constantly changing their leadership and realms of control. One such mutation was particularly critical in shaping the drug war into what it is today: the independence of Los Zetas from the Gulf cartel in 2010. Originally a paramilitary group for the Gulf cartel, the United States’ Drug Enforcement Agency (DEA) has cited Los Zetas as Mexico’s most “technologically advanced, sophisticated, and violent” cartel (Lee & Renwick 2017). Although they have lost some of their hold in recent years, Los Zetas ultimately transformed the type of violence pertaining to the conflict by influencing other criminal organizations to adopt the military tactics and weapons associated with the paramilitary group. Although now common, before 2007 attacks “involving fragmentation hand grenades, 40 mm grenades and RPGs were somewhat rare and immediately attracted a lot of attention” (Burton 2009). While it is not the only piece of the puzzle necessary in attenuating the hostility south of the border, it would be foolish to ignore the United States’ hand in the current conflict. On September 10th, 2010 President Calderon referenced the two-sided nature of the war, saying, “We live next to the world’s largest drug consumer, and all the world wants to sell them drugs through our door and our window. And we live next to the world’s largest arms seller, which is supplying the criminals” (CNN Library 2017). Nearly all of the deaths in Mexico are a result of small arms, not artillery, tanks, or combat aviation, which, considering the enormous death toll is quite alarming (Cook 2017). Mexico has long-enacted strict gun laws, meaning that all of these weapons are illegally making their way across the border. As Calderón stated, the majority of these guns are coming in from the United States. Between 2009 and 2014, over 73,000 guns seized in Mexico were traced back to the United States, making up about 70 percent of the total 104,850 guns seized. Of these, a considerable amount were traced to Texas, California and Arizona. Insufficient documentation and a lack of cooperation from the U.S. gun control agencies made it impossible to track who had originally purchased any of the weapons. In addition, cartels and their suppliers have found a new loophole; unfinished gun parts, like barrels and triggers, are not included in the U.S. Gun Control Act and do not require any sort of serial numbers or tracking (Chappeli 2016). And, of course, the U.S.’s enormous appetite for the illegal substances behind the conflict provides billions of dollars, fueling corruption within every level of the authorities in Mexico. In 2010 alone a Rand Corporation study estimated that consumers in the U.S. spent about $109 billion USD on illicit drugs (Lee & Renwick 2017). Since the start of the conflict, the United States has donated about $1.5 billion USD through the Merida Initiative, and Mexico directed over $54 billion USD towards their security and defense. Unfortunately, this money has simply made the security industry more secretive, violent and open to corruption (Lakhani & Tirado 2016). In response, a number of independent Mexican citizens have taken matters into their own hands by forming vigilante groups called autodefensas to counter the cartels. When first developing, the administration strongly opposed the efforts of the autodefensas, but it began to cooperate with many as the situation worsened, despite worries that multiple members of the self-defense groups are simply working on behalf of battling gangs (Woolf & Hackel 2014). Now, Mexico is attempting to rework its criminal justice system in order to professionalize its police and improve the courts. This effort is particularly focused on transforming the trial system to a process similar to that of the U.S. Right now, the majority of cases are handled behind closed doors by a judge reading a written testimony (Planas 2017). While a necessary start, for the Mexican citizens who continue to live in the shadow of the cartels terrorizing their communities and puppeteering the police and military meant to protect them, a more drastic action is long overdue. Cook, Jesselyn 2017. “Mexico’s Drug War Was World’s Second Deadliest Conflict in 2016”. 10 May. Huffington Post. Available to read here: http://www.huffingtonpost.com/entry/mexico-drug-war-deaths_us_5911d69fe4b0a58297df921b [Accessed 6 September 2017]. Lakhani & Tirado 2016. “Mexico’s war on drugs: what has it achieved and how is the US involved?”. 8 December. The Guardian. Available to read here: https://www.theguardian.com/news/2016/dec/08/mexico-war-on-drugs-cost-achievements-us-billions [Accessed 5 September 2017]. Lee & Renwick 2017. “Mexico’s Drug War”. 25 May. Council on Foreign Relations. Available to read here: https://www.cfr.org/backgrounder/mexicos-drug-war [Accessed 5 September 2017]. Chappell, Bill 2016. “In Mexico, Tens of Thousands of Illegal Guns Come From The U.S.”. 12 January. NPR. Available to read here: http://www.npr.org/sections/thetwo-way/2016/01/12/462781469/in-mexico-tens-of-thousands-of-illegal-guns-come-from-the-u-s [Accessed 5 September 2017]. CNN Library 2017. “Mexico’s Drug War Fast Facts”. 16 May. CNN. Available to read here: http://www.cnn.com/2013/09/02/world/americas/mexico-drug-war-fast-facts/index.html [Accessed 5 September 2017]. Woolf & Hackel 2014. “Mexican citizens take the drug war into their own hands”. 16 January. PRI. Available to read here: https://www.pri.org/stories/2014-01-16/mexican-citizens-frustrated-their-government-take-arms-against-drug-cartel [Accessed 5 September 2017]. Planas, Roque 2017. “6 Things Going On In Mexico’s Drug War That Matter More Than El Chapo”. 16 January. Huffington Post. Available to read here: http://www.huffingtonpost.com/entry/mexico-drug-war_us_56a7995fe4b01a3ed123dbd9 [Accessed 6 September 2017]. Burton, Fred 2009. “Mexico: Economics and the Arms Trade”. 9 July. Stratfor Worldview. Available to read here: http://www.huffingtonpost.com/entry/mexico-drug-war-deaths_us_5911d69fe4b0a58297df921b [Accessed 6 September 2017].